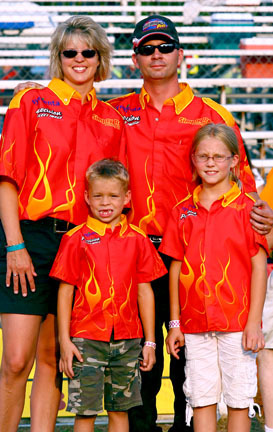 Driver Bio: Rob is 35 years old, married to wife Tanya, and they have 2 children. "I grew up watching my dad pull a modified tractor, and I started out with a farm tractor in 1985. In 1990, I had my first experience with a street legal pickup and it all started from there." Our first year with NTPA was in 1994. We began Grand National pulling in 1997. A special thanks to my sponsors: Precision Fleet Image, Precision Autobody, Sygenta Crop Protection, Proformance Pros, Daylight Enterprises, Titan Speed Engineering, All Star Performance Parts, VP Race Fuels, Tonneau Master Covers. I also get a lot of support at home from John Cassens, Jon Zehnder, Tim Nunn, Anne Goodchild, Mike Day, Randy Kleikamp, Brian Ashley, Todd Humpert, and Kevin Prime. 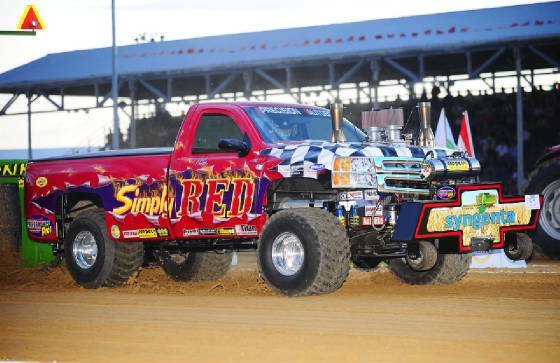 I would also like to thank Truck Pulling Unleashed for having this competition, it has been fun and entertaining. I would also like to thank all those who took the time to vote for Simply Red.